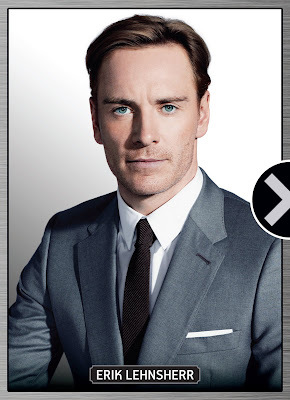 Fassinating Fassbender - A Michael Fassbender Fan Blog: Just learning about Michael Fassbender? What took you so long? Just learning about Michael Fassbender? What took you so long? This promotional X-Men still of Michael Fassbender as Erik Lehnsherr is disturbingly perfect. When Michael's face is airbrushed, he looks so jaw dropping beautiful that it's intimidating. When I look at this picture, which I found here, I recall the quote from a wonderfully positive The Hollywood Reporter review which says, "The cast is almost absurdly easy on the eyes and is most powerful at the top, thanks to the intense Fassbender, who will now need no audition if Daniel Craig decides to give up Bond after another picture or two." As I anticipated, X-Men frenzy is nearing the boiling point and lots of people are just now learning about Michael Fassbender and doing internet searches on him, and finding this blog and other Fassbender fan sites. So once his name and premiere photos began to appear everywhere in the past few days, people became curious about him, and they enthusiastically sought out information about him to learn more about Michael. I'm happy that you have found Fassinating Fassbender, but mind, you will not find teeny-bop gossip about Michael here, just the important stuff. Welcome to Fassy Fandom... what took you so long? They're sort of like fair weather fans to me because Michael has been around so long and in so many good movies, it's only now that he's in a big blockbuster movie people 'see' him. I know what you mean, but most of them are brand spankin' new fans. And that's all good. I just dislike it when many of those new fans focus on things that are not related to his actual acting and career. *Swoon*...This picture of Fassbender is as close as one can get to the James Bond character as originally described by Ian Flemming. Bond is of slim build, with cold blue eyes, and a "cruel" mouth. His mien is suave, dark, cunning, and dangerous. Bond is an anti-hero--he's a killer. That's what I like about Daniel Craig and Timothy Dalton's Bond interpretations. They both played Bond dangerous and dark, but witty without being the joker. Fassy can do all this and make it his own. He would also be the most physical and the most handsome 007, :-). Oh sister you will learn about Michael here at FF. There's lots to read. Better late then never. Welcome! In just a few more hours, I'll be going with my friend to see Jane Eyre, too! I had wanted to see it before, but had forgotten about it. :( Also the fact that it wasn't playing near me and nobody wanted to go with me also made me not go. But my friend wants to see Fassbender and Jamie Bell, so yay! :D And it's about twenty miles from me, in a 2 dollar theatre, but I am not complaining. At least it's still playing somewhere in LA! I can't believe that it hasn't opened in the UK yet! I soooo love Michael Fassbender. He's a totally awesome guy, he is ABSOLUTELY perfect for the role.. He did it justice. BRILLIANT pic and web! ♥ u simone.